N-STAR c which is procured and owned by NTT DoCoMo was successfully launched by Ariane 5 (Ariane Space), at 8:21(AM) (JST), in July 6, 2002. The outline of the opening address and two papers which shows the direction of satellite bus technologies from the 20th AIAA ICSSC 2002 held in Montreal, Canada from May 12 to 15 will be presented. 23rd International Symposium on Space Technology and Science(ISTS) was held at Shimane Prefecture in Japan from May 26, 2002 to 2 June. The Communications Research Laboratory (CRL) and the Electronics and the Telecommunications reseach Institute of Korea (ETRI) have been conducting the Korea-Japan high data rate satellite communications experiments. 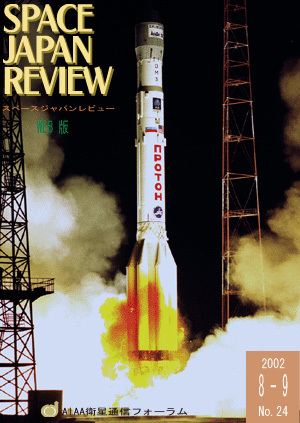 In this issue, starting from the message by Dr.Taniguchi, who is leading the Japanese Government space policy from the Industry standpoint, interview with Mr.Jackson ( CEO, Asiasat ) and Dr.Koh ( VP, New Skies Satellites) would provide interesting discussion by influential top managements in satellite communications operators in Asia Pacific. In September, DRTS ( Data Relay Test Satellite ) and USERS (Un- Manned Space Experiment Recovery System ),both developed by Japanese Government, are launched by H-2A #3 vehicle. Looking forward to the complete launch and mission success.